Goodbye stranger, it’s been nice, hope you find your paradise. Well, as this semester comes to a close I am saying a farewell to Breaking Bordentown for the time being so I can take a hibernation of sorts. It is possible I will continue to update this blog on the occasion with less reporting and more photos of things around Bordentown (and possibly a little outside of Bordentown – literally Breaking out of Bordentown) I take on my cellphone that I find interesting or funny and it will certainly be more light hearted/more personally biased. I’ve met some extremely wonderful people in this small town and it has been a pleasure getting to delve a little deeper into it. Enjoy your holidays, folks. Be safe, take care, and I’ll possibly see you in spring. The economy in New Jersey is, without a doubt, struggling. With one of the worst recessions in recent memory, the state is attempting to adapt to the unstable economic climate in any way possible. The state senate recently proposed a bill to increase the minimum wage to $8.50 an hour. How this will effect the state is still unknown with some sides arguing it will help ease the economic tension and others arguing it will only cause businesses to inflate their prices to compensate for paying workers higher hourly wages. Bordentown itself is not immune to the recession. According to City Data, the state’s unemployment rate is at 9.7% with Bordentown’s unemployment rate shortly under the state average at 9.5%. Bordentown’s retail trade makes up the second most common industry in the town. This begs the question, in the light of economic hardships, what does that mean for the average small business owner? The Record Collector in Bordentown is an example of how small businesses are attempting to take on more facets than just “retail” in order to maintain a steady business model. Whereas record stores used to be able to only sell music and music related items with the recession and the plight of the vinyl record store at the hands of digital media, John Chrambanis has adapted his business to suit those seeking live entertainment as well as CDs or records by holding concert events in the store itself. The racks are all on moveable shelves to make room for a stage. Chrambanis hopes to expand his business even more so to create a small cafe setting where people can relax and listen to live music. Though he does not plan on investing money in a liquor license not only because they’re expensive but because of the way alcohol could alter the chilled out environment. Chrambanis is only one example of ways businesses in Bordentown are trying to retrofit themselves into the overall feeling of hardship in the state. With all this in mind, the state small business sector has shown some hesitant signs of improvement. According to Charles Steindel, an ecomonist for New Jersey, the state’s recovery hasn’t been spectacular but it has been steady. Though according the state data jobs in the fields of manufacturing and construction has fell those in wholesale and retail trade as well as professional and business services have grown which indicates high hopes for Bordentown’s economic future it stays steady with the state average. Below is an interactive Google map of some of the shops located along Farnsworth Avenue in Bordentown. Thomas Moyer, co-owner of Shoppe 202, talks about his store around the holidays. As always, the shops and restaurants that line Farnsworth Avenue have decked their storefronts in lights, wreaths, garlands, and other Christmas decorations to bring in the 2012 holidays. Below are a few shots of the town all lit up. 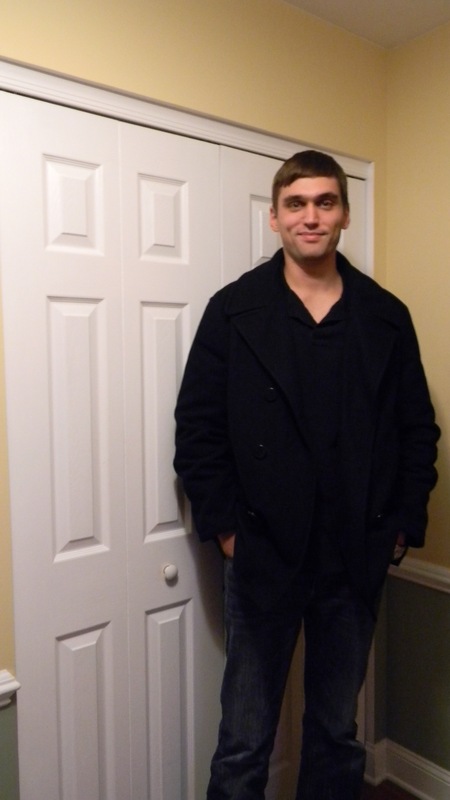 On Thursday November 7th, I sat down with Tim Hartmann, a 26-year-old resident of Bordentown, who won the local election for a postion on the Bordentown Regional School Board to discuss his political standings and his plans for the three year term. 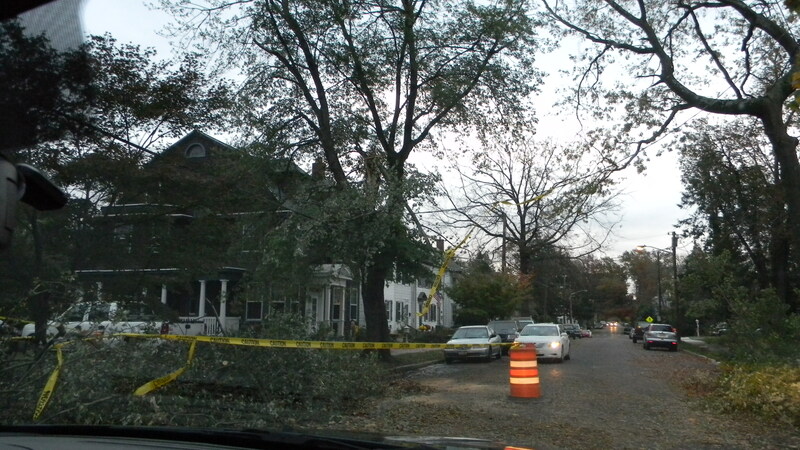 Bordentown was lucky enough to have minimal damage compared to the towns located along the Jersey shore but it did not survive Hurricane Sandy completely unscathed. 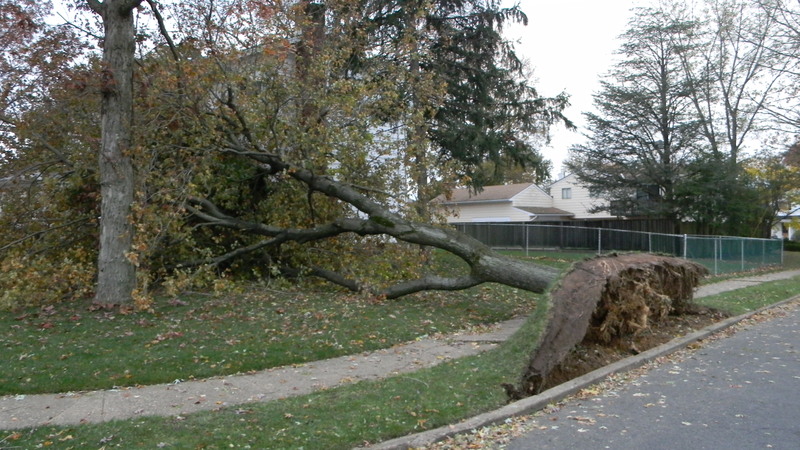 Most of the damage around the city and the township came from high winds that knocked down trees into power lines causing many residents to lose power, some of who are still in the dark. PSE&G has a twitter feed updating the power situation for those towns under their coverage. Downed tree at the end of Yorktown Road that just barely missed the house behind it. 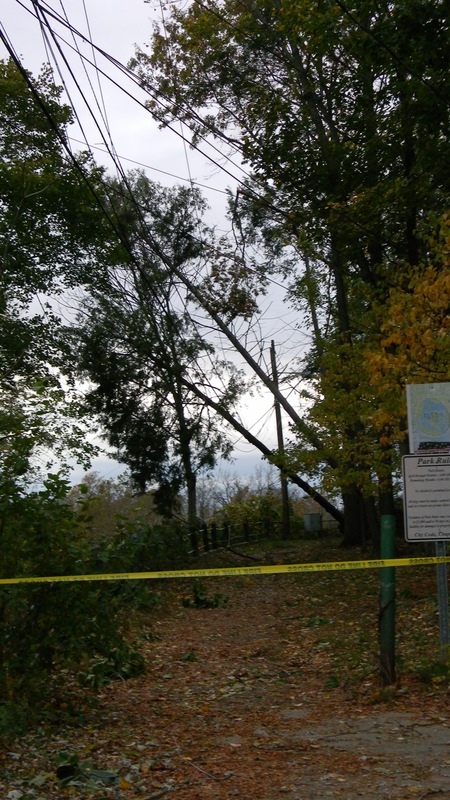 Trees along the path at the end of Farnsworth next to the Bordentown Yacht Club are precariously perched on power lines. 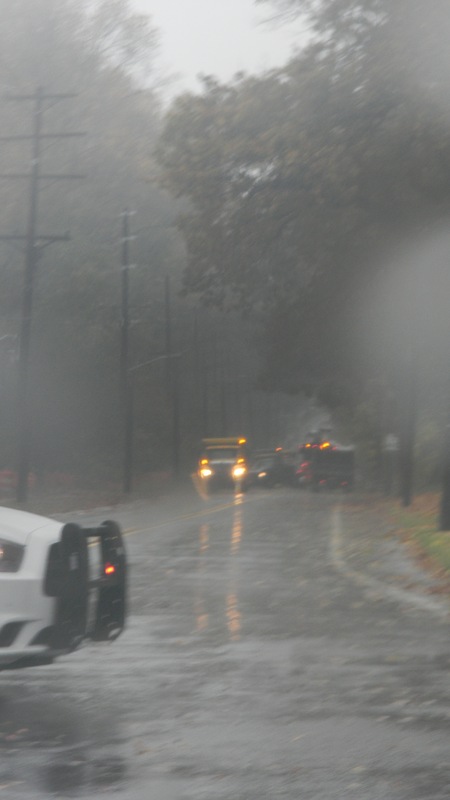 Prince Street near the Delaware is partially blocked by trees and unstable power lines. 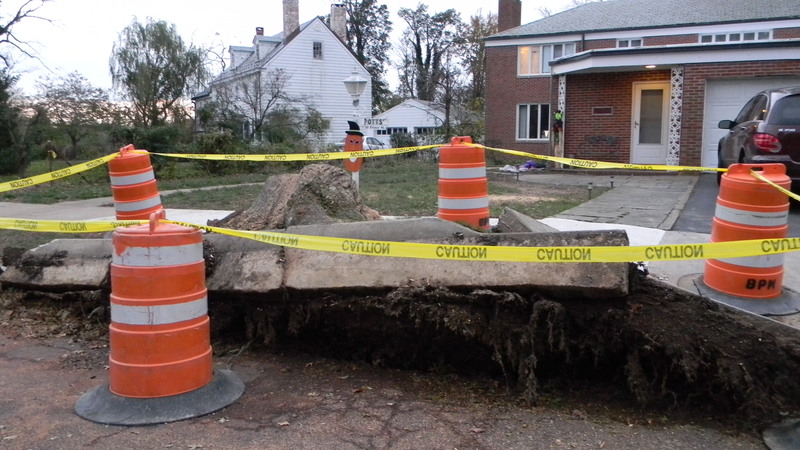 Sidewalk on Prince Street near the River Line leveled from an uprooted tree. 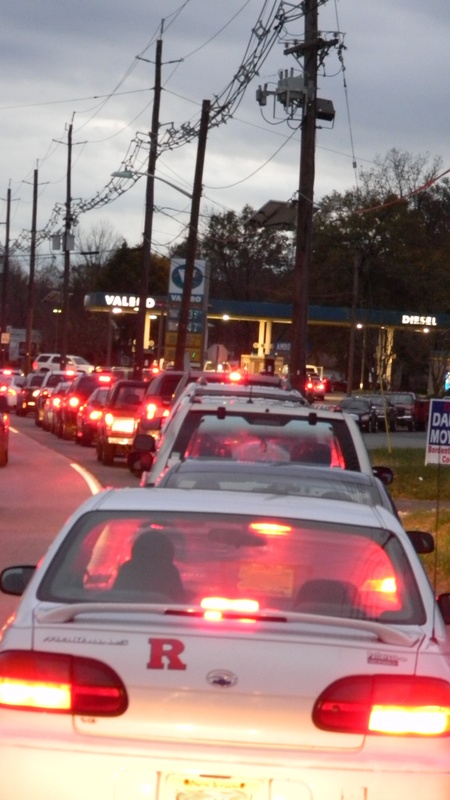 The annual Bordentown Halloween Parade has been moved to Sunday, Nov. 4th at 2 p.m.
Gas shortages all over the state are causing people to flock to the pumps in massive numbers causing long lines and high prices. Bordentown has not been immune to the lines of cars piling up on highway shoulders. 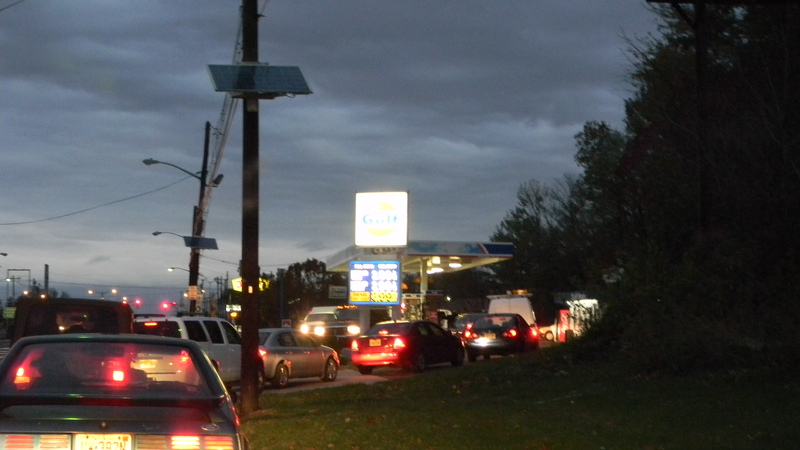 Long lines at the Valero on Route 130 south near Northern Park. Another line at the Gulf in Bordentown where Route 206 meets with Route 130. 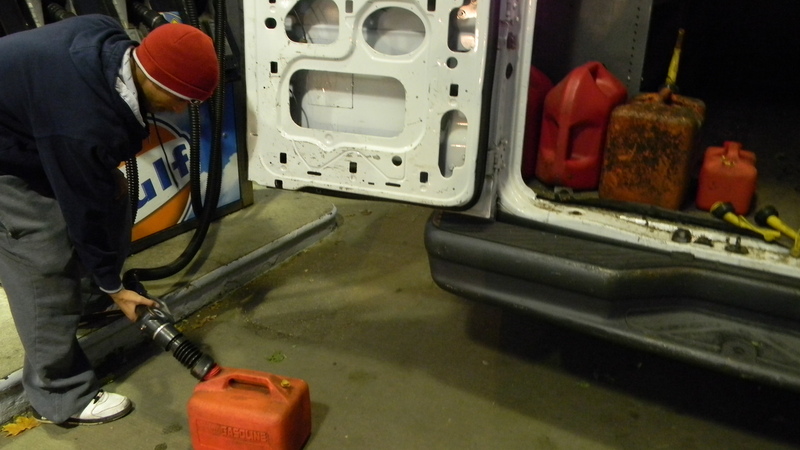 People are not only filling up their cars but cans for their generators. The Gulf in Bordentown is currently open with gas at $3.89 a gallon. The Valero (streetview unavailable, it is near Groveville Road on Route 130 South) in Bordentown is open and appears to have the longest lines with gas at $3.37 a gallon. The Valero on Route 206 South is open with gas at $3.47 a gallon, the Valero located near the Turnpike .4 miles down the road is also open at $3.49 a gallon. I personally went to the Valero that can be accessed heading into Bordentown last night when there were no lines. It was open but their gas had been sold out besides Super, which is $3.69 a gallon. The Citgo and the Exxon across from it on Route 130 in Bordentown are both closed. Some gas stations around New Jersey have been accused of price gouging, which is illegal. If you see or suspect any sort of price gouging, a hotline number is available at 800-242-5846 to report any suspicious price hikes. Having grown up in the great state of New Jersey, or as I lovingly call it “Dirty Jersey,”I have not known one summer without the Jersey Shore, whether it be the boardwalk at Seaside or Jenkinson’s at Point Pleasant, my childhood vacations to Avalon where my parents rented a beach house, or recently just relaxing at the beach a few blocks down from my parents’ condo in Belmar. My brother and I at Avalon as kids. Many people have suffered personal losses from Hurricane Sandy, including homes and businesses with some people even losing their lives. As a state I feel like we’ve lost something else as well: the heart and soul of New Jersey. 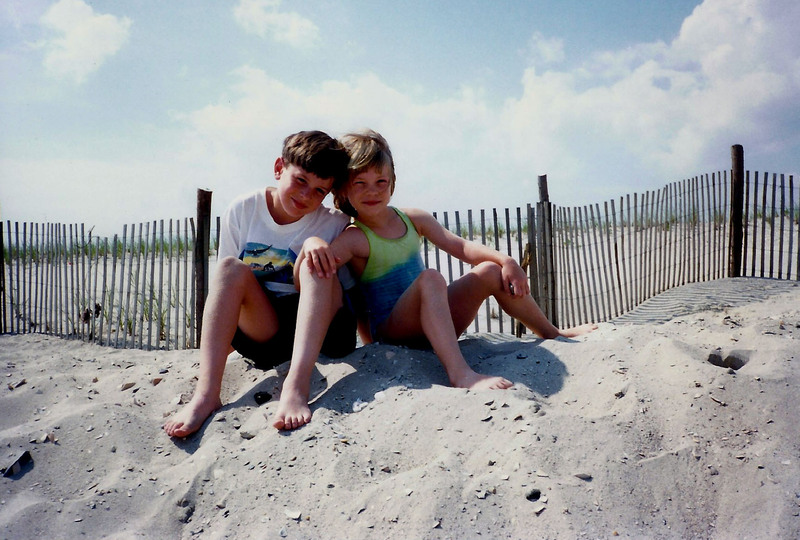 For a lot of us who grew up here, the shore is a physical representation of our childhood summers and as adults it means a peaceful retreat only 30 minutes away. Let’s face it, Jersey doesn’t have the best cities to visit: Camden’s a mess and Trenton’s closing in behind it. Sure, we can take the train to Philly or NYC but the shore is ours. It’s unique to us as a state, it’s something we can call our own. To witness the damage done all along the coast is simply heartbreaking, more than just on a physical level, but it’s emotionally disturbing, knowing that something that means so much to so many of us simply no longer exists. If you wish to give to a charity, The Huffington Post has compiled a list of tips for donating. 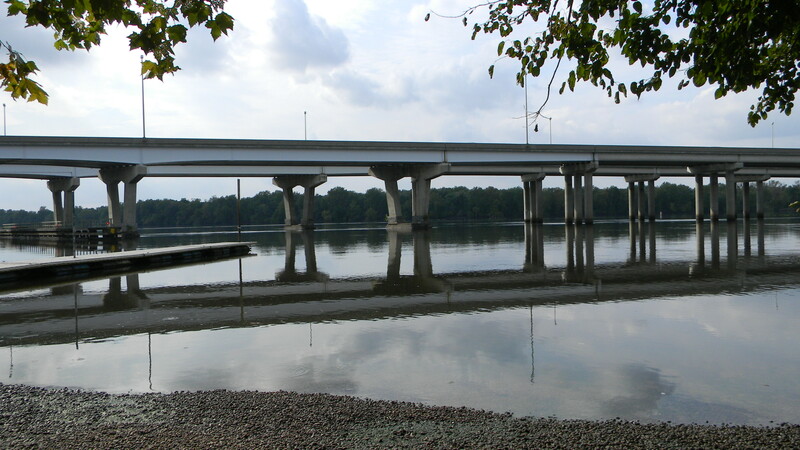 Bordentown sits on the Delaware River which is notorious for overflowing during heavy rainfall. Hurricane Irene last year flooded highways and towns along the river and it appears Sandy will have the same, if not worse, effect. 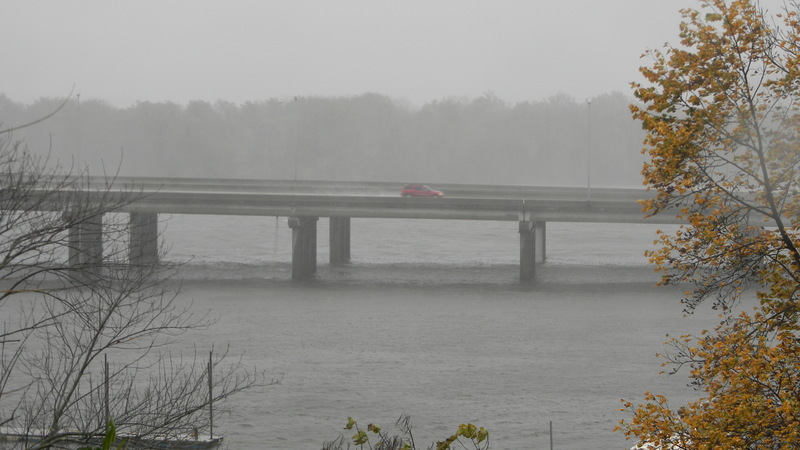 As of 1:00 p.m., the Delaware River has risen 4 feet higher against the levy that keeps it from flooding 295 and the New Jersey Turnpike. 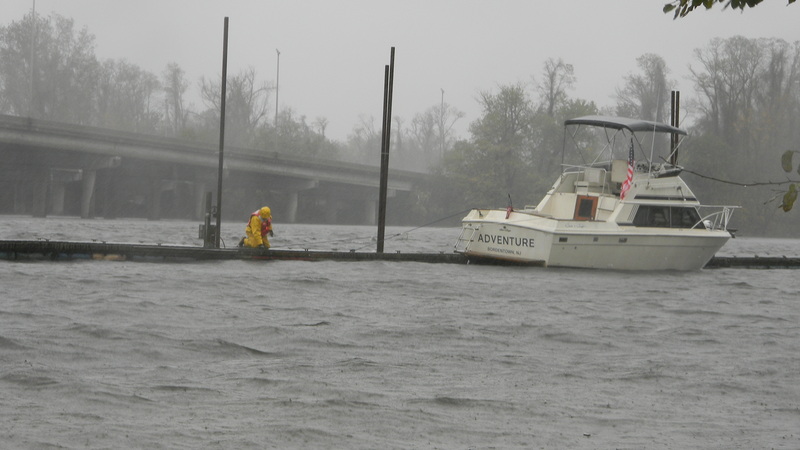 The following pictures were taken in Bordentown around 2:30 p.m.
A man tying his boat to the dock at the Bordentown Yacht Club. 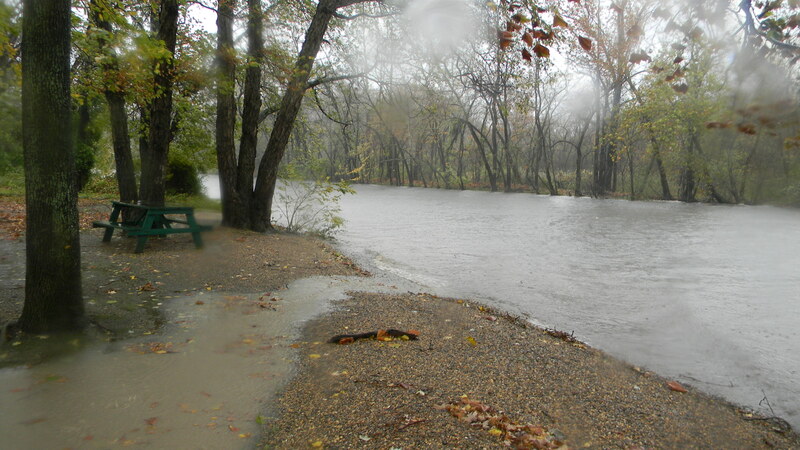 Black’s Creek that branches off the Delaware into Bordentown is already flooding. 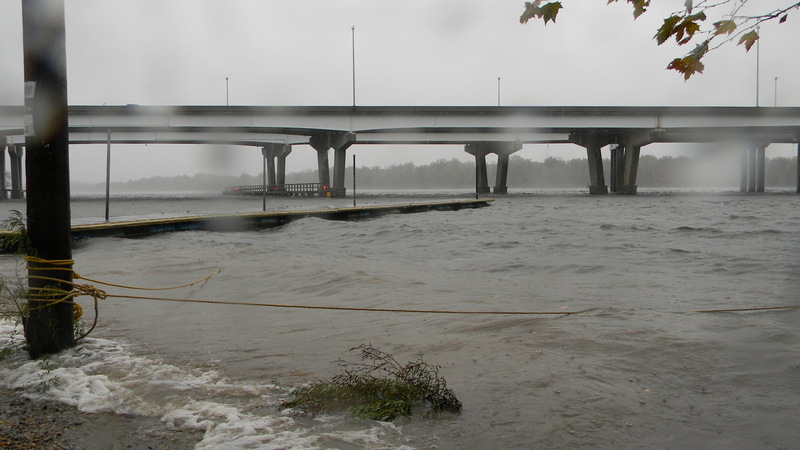 Video taken of the Delaware River around 2:30 pm at Bordentown Beach. A side by side comparison of the river from September 29th and today, October 29th. West Burlington Street that goes from Bordentown to Chesterfield is currently closed so if you must travel, stick to route 130 or you will be turned around. All stores in Bordentown City are currently closed, including both Boyd’s Pharmacy and Mast Pharmacy as well as all public transportation. If you are in the area, the Wawa on Route 130 off of Dunns Mills Road is open and has plenty of food and water but are out of batteries. Again, state officials are stressing that people stay indoors unless they are being told to evacuate. Fema has also compiled a list of other steps and precautions that should be taken during a hurricane. 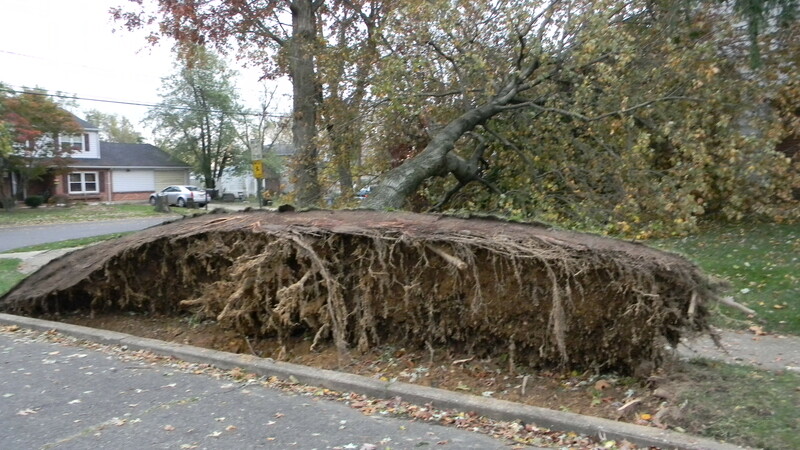 Hurricane Sandy is set to hit Burlington county later this evening.